Babies under 9 months of age are free to attend Music Together® classes with a registered sibling. Siblings, cousins and friends from out of town, 9 months old through kindergarten age, who are not registered, can visit a class for free once during a session, based on availability. Each additional visit will be $15 and is subject to space availability and our approval. We would love for you to bring other family members to class - babies, older siblings, grandparents, aunts and uncles, as well as special family friends or nannies. It's the model of live family music making that we want to set for the children and the presence of their special people in their class always makes the children proud. Older children always add to the quality of the class. 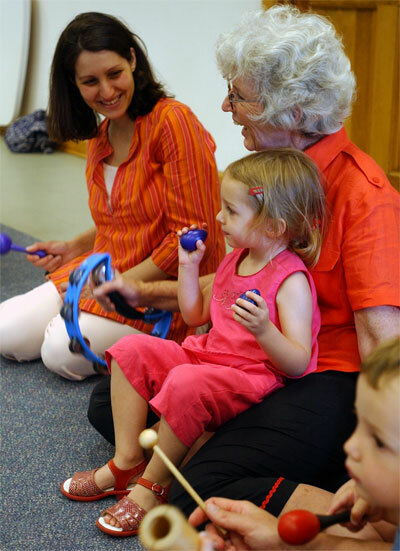 Babies of any age will benefit from the exposure to a musically rich and stimulating setting we create. Please always let us know that you will be bringing someone, by talking to your teacher or emailing us, so we can check whether space is available.